Gosh! Win10’s been getting beat up a LOT lately, including here at Win10.Guru. That’s one reason why I decided to put forward a more positive post on Win10 today. Sure, Win10 has its problems and its occasional gotchas. But all in all, it’s a capable and powerful OS. Let me explain why I still like it so much. I’m going to present a real-world example, based on some of this morning’s activity here in my home office. I’m on the schools committee for Princeton where I went to undergraduate school. This is my first year to jump up from candidate interviewer and occasional volunteer to a more substantial role as a committee chair. 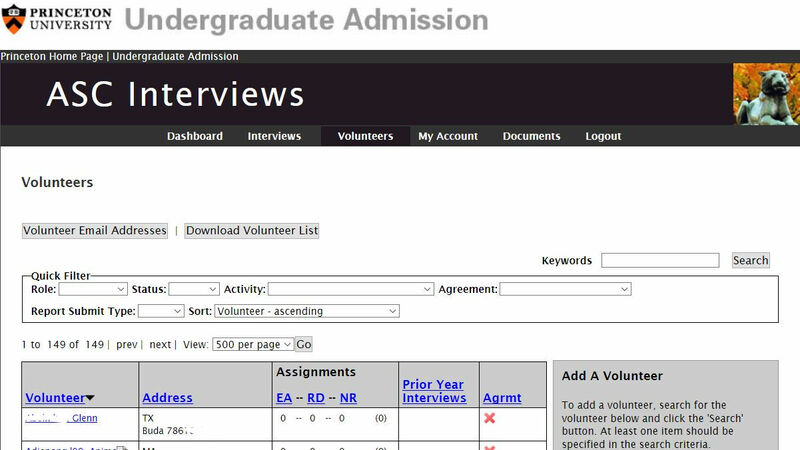 Today, November 26, is the deadline for alumni interview reports on candidates for early admission (Princeton lets candidates check a box on their application forms if they want to meet and speak with a Princeton grad as part of the application process). We had 32 early admit candidates request an interview. My job as committee co-chair was to assign them to specific alums and then to bird-dog completion of those reports. As of this morning, 6 of the 32 reports are still outstanding. Lloyd Lawrence, my fellow co-chair, called me at around 9:15 and informed me we needed to reach out to those 6 alumni volunteers. He also said he wanted to text them and send them emails as reminders. “Great,” I replied, “You take 3 and I’ll take the other 3.” And that’s just what we did. He emailed me three names, which I opened in Outlook. I grabbed those names one at a time, then jumped to the volunteer search page that the Princeton Alumni Schools Commitee (ASC) sets up. By pasting each one into the search box, I was able to get their cellphone numbers and email addresses instantly. I pasted the cellphone numbers into Sendatext which allowed me to use my desktop keyboard to send a message to each recipient. To email them, all I had to do was click their email addresses and a Win10 Mail window opened immediately. Write the message, click its send button, and it’s off! Given the online volunteer look-up database, the right apps, and some cutting & pasting, this job is EASY! The whole thing took me less time to complete than it took to describe here in writing: under 3 minutes, in fact. Windows 10 makes these kinds of high-productivity situations routine and humdrum. Just the way I like them to be. And if you stop to think about the hundreds of ways we can all make things like this happen repeatedly, day-in-and-day-out, I hope you’ll agree with me, too!